West Michigan is the Blueberry Capital of the World. Lakeshore visitors who want to sample these delectable berries should check out The Blueberry Store in downtown South Haven. Along with fresh, frozen and dried local blueberries, the store sells a number of gourmet blueberry items. From all-natural juices, candies, freshly baked muffins and donuts to tee shirts and mugs, it's all here. Great Lakes shipping was crucial to the growth of our nation, and lumber was the engine of this burgeoning economy. However the lumber would never have safely reached port without lighthouses to guide them. By the 1870s, the White Lake/Muskegon area was proudly dubbed 'Lumber Queen of the World' - a title that would have been difficult to achieve without the White River Light Station. Ghost lovers take note - the lighthouse is said to be haunted by its first keeper Captain Robinson. - White River Light Station. Blueberries are the healthiest fruit you can eat. In fact, blueberries rank number one in antioxidants compared to 40 other fruits and vegetables. But we didn't need USDA researchers to persuade us to eat these delicious berries. Even better we don't have to hull, pit, peel or core these fruits to enjoy them. Don't forget to check out the Calendar of Events for August and September. For boaters we've compiled a directory of marinas. Foodie and locavore alert: LEL has compiled a list of Apple Orchards and Cider Mills along the lakeshore. History buffs haven't been forgotten. 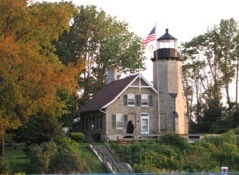 This issue our Lighting the Lake section features Whitehall's White River Light Station. So sit back and enjoy our latest Lake Effect Living. And let the lake work its magic on you.